We are a leading Manufacturer of uc20 hspa module from Bengaluru, India. UC20 is the latest Quectel UMTS/ HSPA+ module offering a maximum data rate of 14.4 Mbps downlink and 5.76 Mbps uplink. UC20 is designed to provide customers with global network coverage on the connectivity of HSPA+/ WCDMA. It can also be fully backward compatible to existing EDGE and GSM/ GPRS networks through multi-band combination of quad band WCDMA and quad band GSM. The tiny profile of 32.0 × 29.0 × 2.5mm in cost optimized SMT form factor and highly integration level enable integrators and developers to easily design their applications and truly benefit from the module’s small size, low power consumption and mechanical intensity. Its advanced LCC package allows fully automated manufacturing for high-volume applications. A rich set of internet protocols, industry-standard interfaces (USB/UART/ PCM/ ADC/ Antenna-Diversity) and abundant functions (USB drivers for Windows XP, Windows Vista, Windows 7, Windows CE, Linux, Android/eCall) extend the applicability of the module to a wide range of M2M applications such as automotive, metering, tracking systems, security solutions, routers, wireless POS, mobile computing devices, PDAs, and tablet PC. 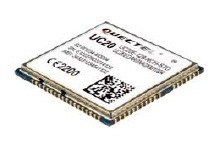 Looking for Quectel UMTS-HSPA Module ?